Dietrich College of Humanities and Social Sciences › News › News Stories › 2018 › April › Mark Kamlet Speaks at “Unleashing American Innovation” Symposium in D.C. If technology transfer did not operate the way it currently does, it is safe to say that there would not be a Google — or countless other advances. In 1980, the Bayh-Dole Act fundamentally changed the ownership of intellectual properties and inventions made with federal funding, ultimately allowing universities to retain titles and take the lead in patenting and licensing groundbreaking discoveries. A new cross-federal agency effort is underway to consider whether to revamp technology commercialization rules for U.S. national labs, such as the National Institutes of Health (NIH), Department of Defense, Department of Energy and the National Institute of Standards and Technology (NIST). To address the issue, the symposium “Unleashing American Innovation” was held in Washington, D.C. on April 19. It drew several hundred high-ranking government officials and featured speakers from top federal agencies as well as Carnegie Mellon University’s Mark Kamlet. “My own view is that the Bayh-Dole act was one of the most important federal policies of the last 40 years and led to Google, recombinant DNA, Carnegie Learning and key breakthroughs in artificial intelligence,” said Kamlet, Provost Emeritus and University Professor of Economics and Public Policy in the Dietrich College of Humanities and Social Sciences and Heinz College of Information Systems and Public Policy. Kamlet was joined by Marcia K. McNutt, president of the National Academy of Sciences (NAS); Stephen Susalka, CEO of the Association of University Technology Matters; Walter Copan, the undersecretary of commerce and director of NIST; Paul Sanberg, president of the National Academy of Inventors; Peter McPherson, president of the Association of Public Land-grant Universities; France A. Córdova, president of the National Science Foundation; Christopher Austin, director of the NIH’s National Center for Advancing Translational Sciences; Wilbur Ross, the secretary of commerce; Deborah Wince-Smith, president and CEO of the Council on Competitiveness; and William Elkington, president and chair of the Licensing Executives Society. In his remarks, Kamlet stressed that the key issue on university tech transfer is no longer the nuances of the Bayh-Dole Act’s legal details. “In my view, Bayh-Dole told a system where virtually no intellectual property from university research was transferred to society to a very robust system today. The national labs still labor under the old constraints, which crippled universities. The parties involved in this symposium believe this needs to change. I agree,” said Kamlet. Beyond his role as provost of CMU, Kamlet’s work on tech transfer includes serving on an NAS committee in 2011. 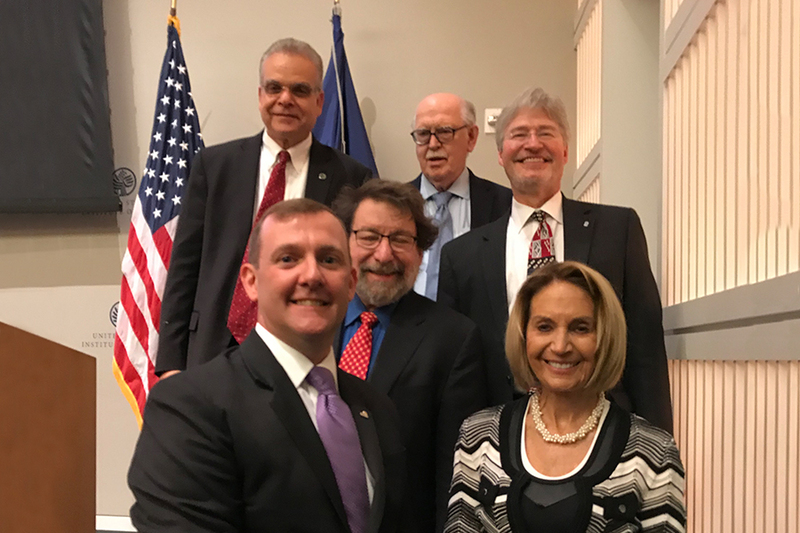 Pictured above: CMU’s Mark Kamlet (center) with several of the speakers at the “Unleashing American Innovation” symposium.